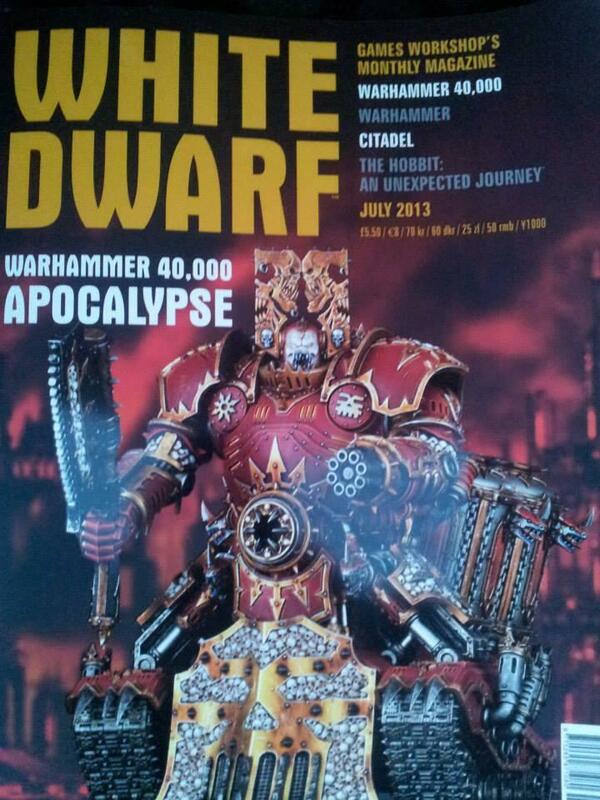 These are supposedly next month's White Dwarf Leak for Apocalypse 2.0, a Khorne Lord of Battle and some kind of cool big Necron monolith. Looks like it will be out in time for Apocalypticon. Which raises the question, will we get to use the new formations and units, or no? I for one will be picking up at least a couple of the new megalith's as they are being called, depending on its stats. Yes you can use them if they come out in time. Matt, I won't be participating but, just curious, will you guys be using the old Apocalypse rules, or will these new units force you to use the new ones? I can't really say until I see the new Apocalypse rules. I suppose most of you have seen it already, but for those who haven't; on GW's website is the advertisement for Apocalypse. This week the thing will go on pre-order, so soon it will be available. Looking forward to seeing if GW actually manages to create a few Apocalypse units that are excitement worthy (new ones that is). I'm just getting the basic book - but I definitely want the new templates. What do I need to build to justify those templates. I bet there will be 1 D-Strength weapon at that size. Boo-yeah!! The big ask...will the new rules be used for Apocalypticon or are we too close? I know I can memorize the new Apocalypse rules in 2 nights. Randolph wrote: I'm just getting the basic book - but I definitely want the new templates. What do I need to build to justify those templates. I bet there will be 1 D-Strength weapon at that size. Boo-yeah!! The big ask...will the new rules be used for Apocalypticon or are we too close? I was reading the leaked stats on the Khorn Lord of Battles; the new rules seem to be streamlined from the Forge World 6th ed. update. No 'structure points - hull point' mixtures, all vehicles have hull points now (the Lord of Battle has 9). Akin to 6th ed. 40k they've introduced a bunch of standard rules that all the superheavy vehicles and formations draw from and refer to. It would seem that these rules are for the most part modified versions of those found in the 40k rulebook. e.g. Superheavy Tank Shock. No more page long details about how such and such the Daemon Lord or Uber Tank functions- all done by the codifying of the rule sets. The points costing of superheavy vehicles seem to be more in line with standard 40k. Weapon loadouts are much more in line with each other- power wise (no more having to choose between the Vulcan Mega Bolter and the Double Barreled 'D' launcher). Possibly one has to pay more for certain weapons- the Khorn Lord of Battles left weapon can be something similar to a beefed up Hades Autocannon, or something that can drop a 10" pie plate of high strength and long range... surely there is no crack potent enough for GW to think these two weapons are the same in destructive power. There are 11 classes of formations/ superheavies. Over 100 formations now exist in one book (so you don't have to do what I did last year to find Dante's Sanguine Host- go to a WD collector and pay 30$ for a single long, long outdated White Dwarf). It would seem from the 'One Click Bankruptcy' options that there are some formations from prior to now that haven't been included in the new book. The Grey Knight Assassin formation, and a Blood Angel Armaggedon formation with three Thuderhawks, springs to mind. It's possible though that GW simply didn't offer it as a OCB, but these formations exists. Glad to see the Endless Swarm is back! Next year I'm bringing Nids! @ Aegis - The additions to the Wall of Martyrs supposedly have non-Apocalypse stats in addition to the 'mega' versions of them, utilisable in standard 40k. @ Randy - My thought was exactly the same as yours. 'What weapon unleashes that 15" blast?' Our answer comes out July 13th according to most sources. Plenty of time to build such a weapon. bigoldfrog wrote: I was reading the leaked stats on the Khorn Lord of Battles; the new rules seem to be streamlined from the Forge World 6th ed. update. Well if you are in the states it is being released June 6th. I've already pre ordered the stuff from my FLGS. Also the WD Apocalypse battle report was awesome. Imperium won sadly, but that's what happens when they get a whole bunch of "free" fortifications. There was even a part where part of the board was destroyed because of the amount of psychic powers used that turn. I can't wait. 'Part of the board was destroyed'?!?! The literal board, the surface everything moves over?! That would be insane!